From Lima airport a direct flight on LAN Airway took us into Iquitos, Capital of the Peruvian Amazon. Iquitos, with a population of just under 500,00, is the largest city of the Peruvian Amazon rainforest and the sixth largest city in Peru. 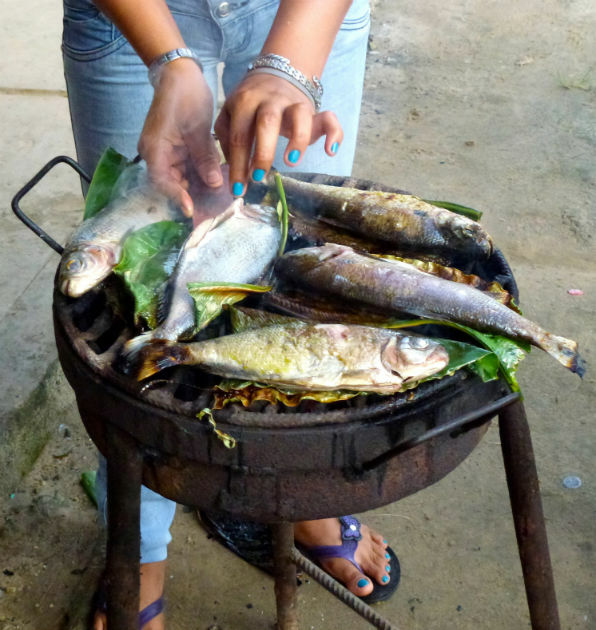 It has the dubious distinction of being the largest city in the world that is inaccessible by road, other than the 100 km road between Iquitos and Nauta, on the Amazon River. The main way to reach Iquitos is by air or by boat. After getting our luggage, we boarded a small bus that drove us the 100 km to Nauta, to board our Amazon riverboat, La Turmalina. On our way we passed people selling fruit along the roadside. Our guide stopped at a roadside stand and purchased some fruits for us to sample. He cut us chunks of sugar cane. 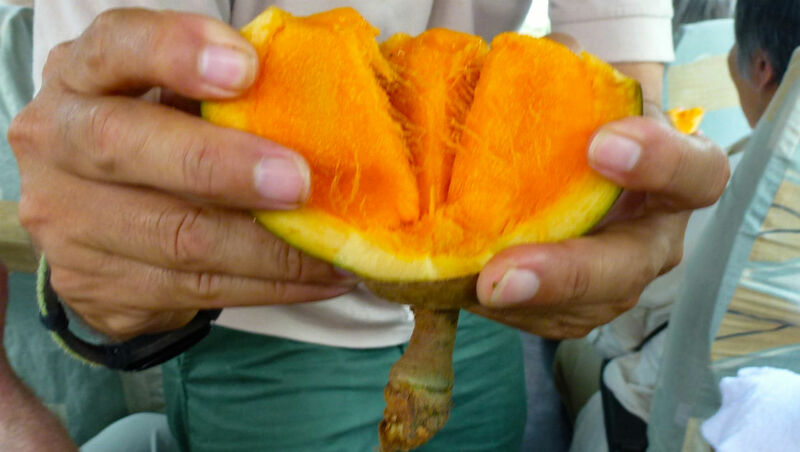 We tasted a Peruvian tangerine - no different in flavour from the tangerines we get at home, which are imported anyway. The highlight though was a fruit I had not heard of before. Called sapporte, it has a mango-like flavour but a more buttery texture. Delicious. We also noticed a common form of transportation, shown in the picture - like the tuk-tuks I traveled on in Thailand, they are half motor-bike, half truck. The small town of Nauta located on the banks of the Marañon river, only a few miles from the confluence of the Marañon and Ucayalli rivers, is the staging village for many of the river boats that ply the Marañòn River, taking passengers to explore the Pacaya-Samiria Nature Reserve. We did not spend any time in Nauta on that first day but boarded the motorized skiffs that took us out to our riverboat. Later in our trip we spent an afternoon in Nauta. The town has a large covered market place with sections for fish and for vegetables. 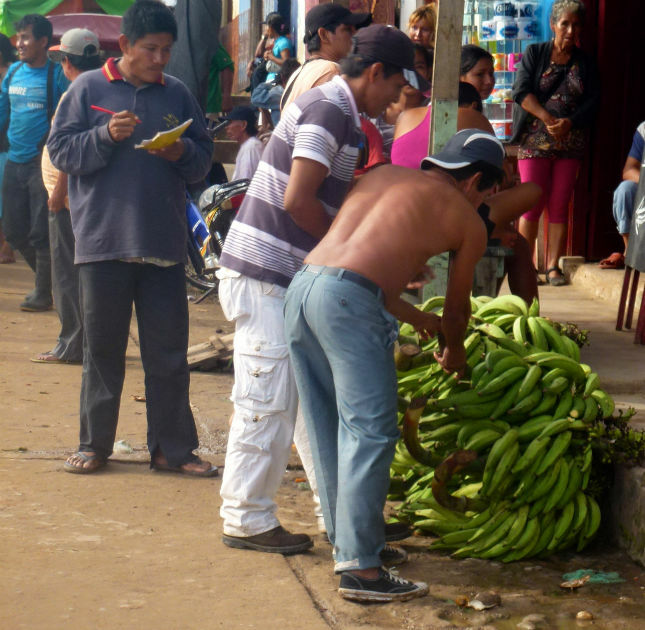 Here are some pictures of market day in Nauta. 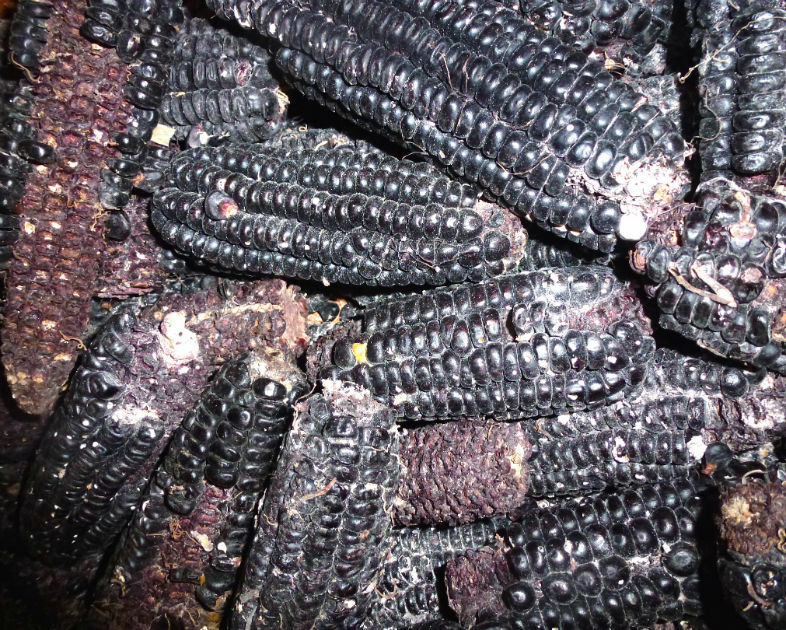 Didn't get a chance to taste the black corn. The gigantic bunch of bananas reminded me of the days I spent in a remote village in Zululand doing my doctoral research into a rare joint disease.